Background: Small vagile eukaryotic organisms, which comprise a large proportion of the Earth’s biodiversity, have traditionally been thought to lack the extent of population structuring and geographic speciation observed in larger taxa. Here we investigate the patterns of genetic diversity, amongst populations of the salt lake microscopic metazoan Brachionus plicatilis s. s. (sensu stricto) (Rotifera: Monogononta) on a global scale. We examine the phylogenetic relationships of geographic isolates from four continents using a 603 bp fragment of the mitochondrial COI gene to investigate patterns of phylogeographic subdivision in this species. In addition we investigate the relationship between genetic and geographic distances on a global scale to try and reconcile the paradox between the high vagility of this species and the previously reported patterns of restricted gene flow, even over local spatial scales. 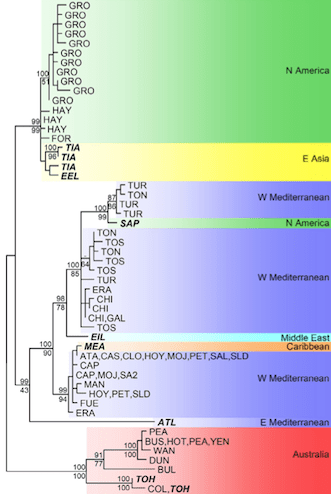 Results: Analysis of global sequence diversity of B. plicatilis s. s. reveals the presence of four allopatric genetic lineages: North American-Far East Asian, Western Mediterranean, Australian, and an Eastern Mediterranean lineage represented by a single isolate. Geographically orientated substructure is also apparent within the three best sampled lineages. Surprisingly, given this strong phylogeographic structure, B. plicatilis s. s. shows a significant correlation between geographic and genetic distance on a global scale (‘isolation by distance’ – IBD). Conclusion: Despite its cosmopolitan distribution and potential for high gene flow, B. plicatilis s. s. is strongly structured at a global scale. IBD patterns have traditionally been interpreted to indicate migration-drift equilibrium, although in this system equilibrium conditions are incompatible with the observed genetic structure. Instead, we suggest the pattern may have arisen through persistent founder effects, acting in a similar fashion to geographic barriers for larger organisms. Our data indicates that geographic speciation, contrary to historical views, is likely to be very important in microorganisms. By presenting compelling evidence for geographic speciation in a small eukaryote we add to the growing body of evidence that is forcing us to rethink our views of global biodiversity.